It is said that there is an ancient tree in the world. People who bless it will get good luck. 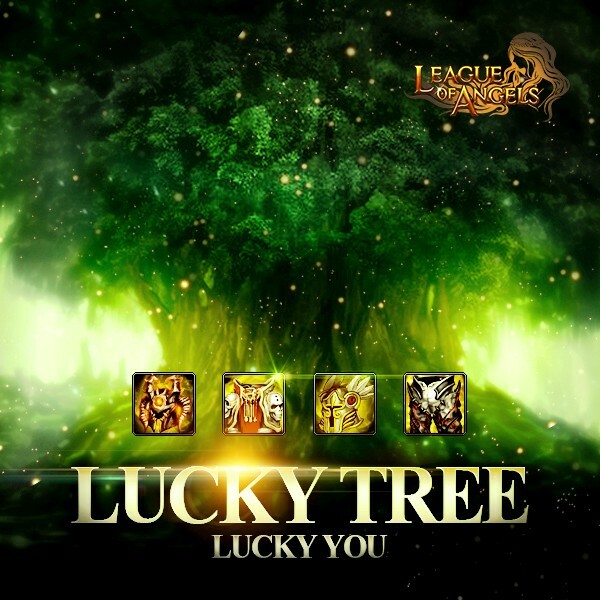 For hundreds of years people calls it Lucky Tree. Many years ago, when the dark forces attacked this land, it disappeared from people’s view. No one knows its location. 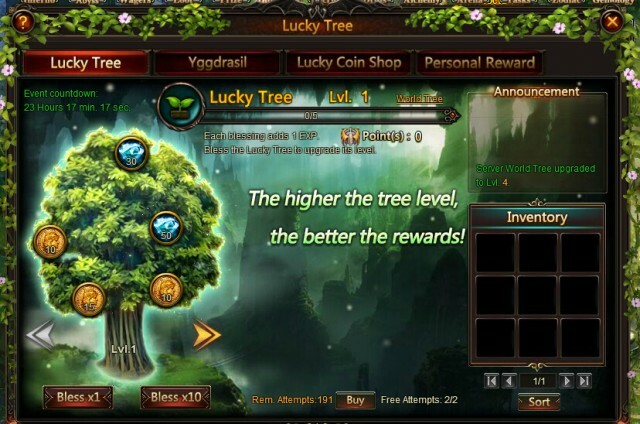 Now Lucky Tree is discovered by angels. They bring it here, and hope to help you get luck and power! 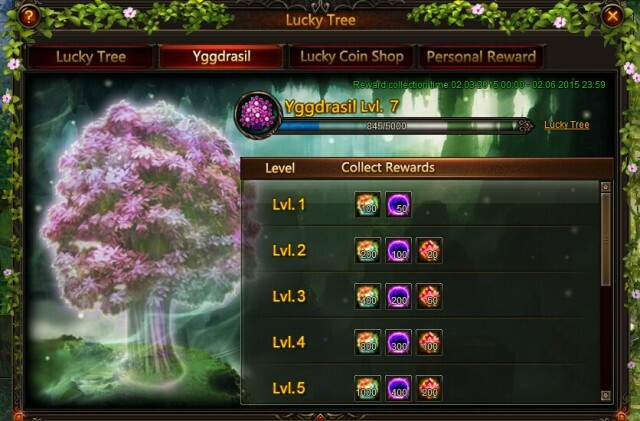 Now Lucky Tree Level is open to level 8, and there are possibilities of getting Odin's Blade in Level 8 Lucky Tree! 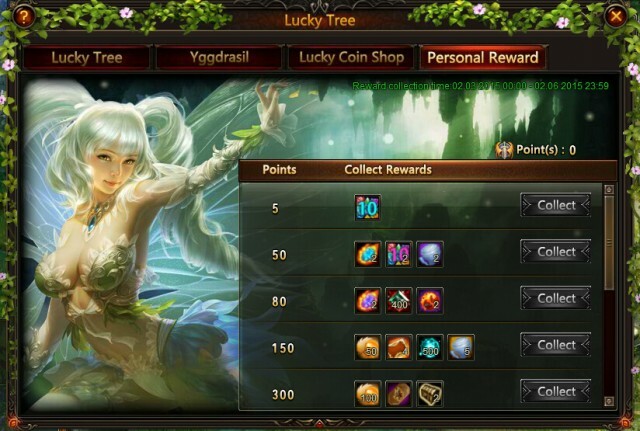 Hurry up to test how lucky you are! 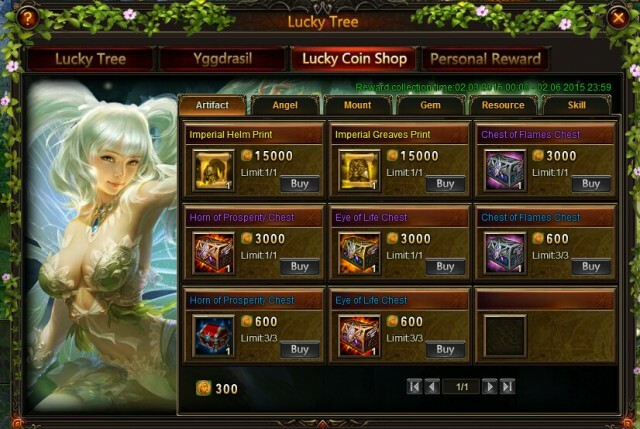 Use your Lucky Coins to buy stunning artifact, such as chest of flames(rare), chest of flames(epic), horn of prosperity(rare), horn of prosperity(epic), galaxy ring(rare), galaxy ring(epic), Imperial Greaves Print, and Imperial Helm Print; Angels, such as Pandora, Raphael, Styx, Vienna, and Amora; Mounts, such as Moonlight Unicorn, Royal Unicorn, Dark Spirit Ram, King Alabaster, and Jeweltone Turkey; Gems, such as Lvl. 11 Dodge+Hit Gem, Lvl. 11 Agility+Hit Gem, Lvl. 10 Superior Gem Chest; and many resources and Skill books. More exciting events are coming up through Feb 3 to Feb 6, check them out in the in-game Hot Events menu now!